Ten Speed Press, 9781607740537, 256pp. When Charles Phan opened his now-legendary restaurant, The Slanted Door, in 1995, he introduced American diners to a new world of Vietnamese food: robustly flavored, subtly nuanced, authentic yet influenced by local ingredients, and, ultimately, entirely approachable. In this same spirit of tradition and innovation, Phan presents a landmark collection based on the premise that with an understanding of its central techniques and fundamental ingredients, Vietnamese home cooking can be as attainable and understandable as American, French, or Italian. Infused with the author’s stories and experiences, from his early days as a refugee to his current culinary success, Vietnamese Home Cooking is a personal and accessible guide to real Vietnamese cuisine from one of its leading voices. Charles Phan is the executive chef and owner of The Slanted Door family of restaurants, and the author of IACP award-winning book, Vietnamese Home Cooking. He received the James Beard Award for Best Chef California in 2004, and in 2011, was inducted into the James Beard Foundation’s Who’s Who of Food in America. He lives in San Francisco with his wife and their three children. Charles Phan’s Vietnamese Home Cooking captures the very heart of Vietnamese food: fresh, pure, full of life, and vibrant with flavor. His beautiful pictures, stories, and recipes make it completely irresistible. The great appeal of Charles Phan’s cooking at The Slanted Door has always been its vivid purity of flavor. It isn’t necessarily simple food, but there’s not a soupçon of trickery or gratuitous filigree involved. In his long-awaited, warmly written first cookbook, Phan reveals the secrets of his approach to the great and varied food of his native Vietnam. A truly magical and illuminating journey into the cooking of Vietnam, with recipes so thoroughly brilliant they will not only allow you to better understand the cuisine of that country, but they will also make you a better cook, Asian or otherwise. Like the best cooking is, Charles Phan’s food is deceivingly complex. 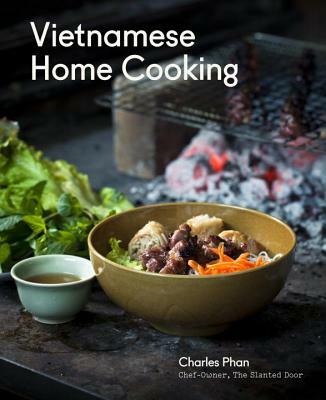 With this book, Charles shows you how to unravel that code and make delicious Vietnamese food at home.